VICTORIA - British Columbia's auditor general says the Liberal government's system of paying the legal bills of government officials and employees facing criminal or civil matters isn't perfect, but it's principled and legal. Russ Jones said Wednesday he found no political interference in the government's decision to pay $6 million in legal bills for former ministerial aides Dave Basi and Bobby Virk, who pleaded guilty to four charges including breach of trust and accepting benefits in connection with the sale of Crown-owned BC Rail. Jones said between 1996 and 2011, B.C. governments spent more than $11 million on special indemnity agreements approved for just over 100 people, of which $6.4 million went to defend Basi and Virk. His 50-page report examined 26 indemnity agreements. The report makes 10 recommendations, including ensuring government indemnity regulations are transparent, consistent, cost effective and well documented. Special indemnities are agreements under which the government pays a person's private legal costs for circumstances not covered under the terms and conditions of employment. "In the case of Mr. Basi's and Mr. Virk's indemnities, senior public servants deliberately didn't consult with ministers or the premier prior to making these indemnity decisions because they did not risk compromising the administration with political influence," Jones said at a news conference. "Overall, we found that government's indeminity practice wasn't perfect, but it was principled. It complied with legislation, but there's always room to clarify responsibility and improve administrative practices." Justice Minister Suzanne Anton did not directly address concerns by opposition politicians and some political commentators that the Basi-Virk plea deal — which saw the government cover their legal bills — was reached in October 2010 just as witness testimony was progressing at the trial. "The auditor general is very clear, it was a decision made at the senior government official level and the politicians were kept out of it," she said. The Opposition New Democrats promised during last May's B.C. election campaign to conduct a judicial inquiry into the sale of BC Rail if elected. 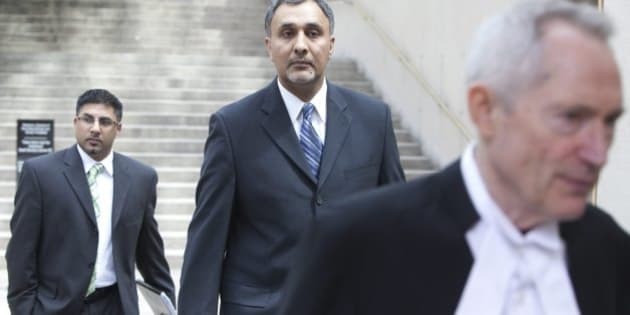 Basi and Virk were charged with fraud and breach of trust in connection with the $1-billion privatization sale of BC Rail in early 2003, culminating in a police raid on the legislature in December that year amid allegations the men leaked government information to one of three bidders. The case dragged on for seven years until it abruptly came to an end October 2010 when Basi and Virk made surprise guilty pleas and the government announced their legal fees had been paid. Earlier this year, B.C. Supreme Court Justice Robert Bauman rejected a request by former auditor general John Doyle for access to government documents connected to indemnity decisions, including Basi and Virk. Bauman, in a written decision, said the request amounted to a sweeping invasion of solicitor-client privilege. Jones said in his audit that the government should move towards removing solicitor-client barriers to allow him to audit the legal costs more fully. The audit found the cost of the Basi-Virk trial was $18.3 million. At the time of the plea agreement, two of a possible 42 witnesses had been called, and the government's Legal Services Branch estimated defence costs would be $2 million more if the trial ran its full course, the audit stated. The audit also stated the trial at the time of the plea deal was costing government about $15,000 for each day for defence and prosecution counsel. The audit stated solicitor-client privilege provisions prevent Jones from auditing the legal bills associated with government-funded defence costs of criminal cases that include serial killer Willie Pickton and the current Surrey Six murder trial. "Over the past 30 years, court proceedings have become longer, more complex, and as result, more expensive," Jones's audit stated. "Audit could offer an important means of helping government and the court system better manage the substantial costs of litigation — costs being footed by provincial taxpayers — while still respecting solicitor-client privilege and the independent role of lawyers and the judiciary."